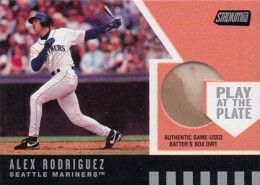 Remember when game-used jersey swatches in sports cards were a novelty? Even the ones of the plain white variety? While that magic may be gone for most, there are plenty of strange things that have been used to create memorabilia cards over the years. Sure, shoes, gloves, tags and face mask helmets are interesting. Hockey nets are cool. But none of these are necessarily weird. Stuffed animals, knee braces and dirt -- now that's weird. And all can be found on sports cards. Here's a look at some of the strangest things ever showcased on memorabilia cards and some of the sets you'll find them in. Today, encased dirt might not be that strange when it comes to memorabilia. Steiner Sports is making lots of it. But when it comes to cards, dirt still seems out of place. 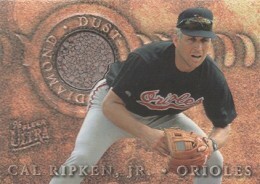 1996 Ultra Diamond Dust is a tribute to Cal Ripken Jr. and is among the first memorabilia cards in all of sports. 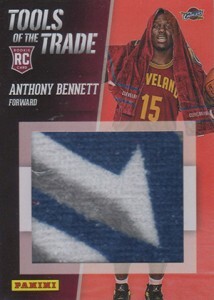 Not offered in packs, they were available direct to dealers and through a wrapper redemption. 2000 Topps Stadium Club Baseball has a pair of dirt-themed sets. 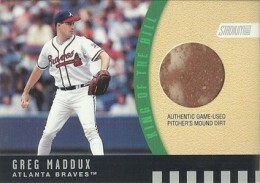 King of the Hill has pieces of pitching mounds while Play at the Plate scrapes from the batter's box. 2013 Upper Deck Goodwin Champions has American river paydirt. A Fenway Edition of the 2012 Topps Baseball factory set has Fenway leftovers. 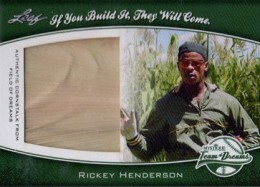 For entertainment collectors, 2006 Inkworks Lost Season 2 has three cards with sand taken from the set. At first thought, cards with towels in them sound lame. It turns out, they actually look pretty neat. Panini has made them a staple in their promo sets like Black Friday and Father's Day often using towels from photo shoots. These have lots of color, often with interesting patterns. 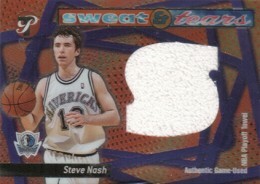 If you go back to 2001-02 Topps Pristine Basketball, collectors can also find pieces of playoff towels in Sweat & Tears. If you're lucky enough to find a Yasiel Puig memorabilia card from a 2013 Topps product, you might be wondering what's going on. 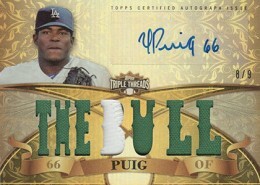 2013 Topps Triple Threads and 2013 Topps Five Star both have cards of the Dodgers outfielder with green swatches. The explanation is a simple one: the Dodgers wore green jerseys in a March 17 Spring Training game against the Arizona Diamondbacks. So while not a regular season gamer, it can be connected to a specific game. 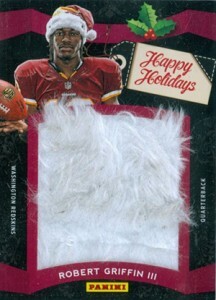 Following along the same lines as the Panini towel cards, the company has gotten into the habit of doing Happy Holidays inserts in their Black Friday sets. These relics have pieces of Christmas hats worn at photo shoots. Upper Deck used to do something similar for their annual Christmas cards. 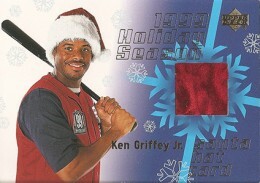 These included Ken Griffey Jr. and Kobe Bryant, not to mention Santa. 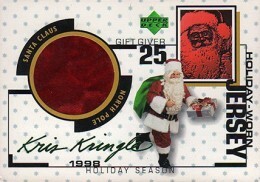 Topps also included a Santa-worn suit card in a small factory set dedicated to the big guy. These Santa hat cards have resulted in some of the softest and fluffiest cards ever produced. It's one of the classic lines in baseball movie history. Special 2013 Leaf Holiday packs come with pieces of cornstalk from the legendary Field of Dreams in Iowa. The cards don't commemorate the Kevin Costner film. Rather, it spotlights the Team of Dreams charity softball game played at the field. The checklist is largely Hall of Famers like Rickey Henderson, Ozzie Smith and Jim Palmer. 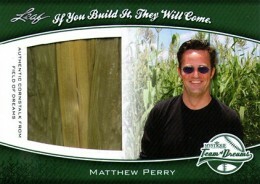 Also included in the set is Matthew Perry of Friends fame. All 2013 Leaf Team of Dreams cards are numbered to 25. 2001 Topps American Pie is technically a baseball release. However, it was one of the first modern sets to heavily mix sports and pop culture. 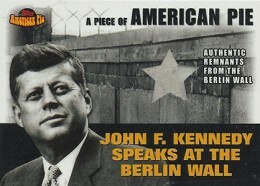 Besides a handful of celebrity-worn wardrobe pieces, the set also included a special JFK card with bits of the Berlin Wall. 2001 Fleer WWF Championship Clash has lots of memorabilia cards, a few of which go beyond the T-shirts and mat pieces collectors are accustomed to. 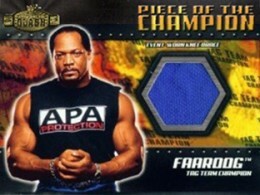 Among them is a piece of a knee brace worn by Faarooq (FSU football legend, Ron Simmons). Good luck finding one of these, though. It's rumored that just eight of the 2001 Fleer WWF Championship Clash Piece of the Champion Knee Brace cards exist. Remember what we were just saying about strange wrestling relics? Here's another one. 2002 Fleer WWE All Access Matchmakers cards come with a pair of memorabilia swatches. The most unique has Kurt Angle and The Rock. One piece is a swatch of The Rock's shirt. The other has a cut up milk carton. Yes, milk carton. Not only is it bizarre, but the pieces look interesting as well. Leave it to professional wrestling for more memorabilia oddities. 2013 Topps Best of WWE includes a card picturing AJ Lee ripping the head off of a teddy bear. If that weren't disturbing enough, pieces of the bear are embedded in the card. Actually, it's kind of cool. 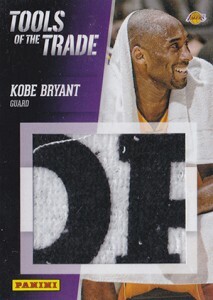 Press Pass is one of the originators of the memorabilia card. They got into the oddities early with cards featuring tires and sheet metal. 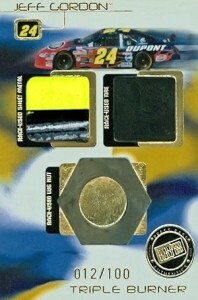 But their strangest memorabilia cards are the ones featuring pieces of lug nuts. 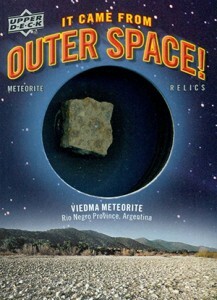 Meteorites and pieces of spaceships are among the things that have made their way onto trading cards. Pieces of space rocks can be found in the insert set It Came from Outer Space in 2013 Upper Deck Goodwin Champions. 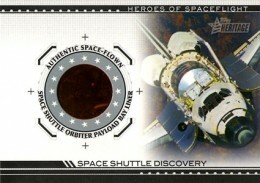 2009 Topps American Heritage has relics with pieces of NASA space shuttles. The market for space collectibles is a big one. So while this seems like a natural fit for a crossover piece, it's still strange to see. 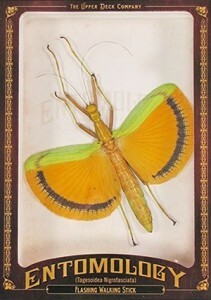 Bugs, butterflies and fossils make up some of the ickiest cards ever made. Upper Deck Goodwin Champions, Topps Allen & Ginter and Upper Deck Champs Hockey have been some of the sets to embed insects and prehistoric pieces into cards. And we're not talk butterfly wings or bug bits. Many of these come showcasing the entire piece. The world of movie and TV prop cards is a pretty wild one. While we're not going to get into them here, there is one set that deserves mention. 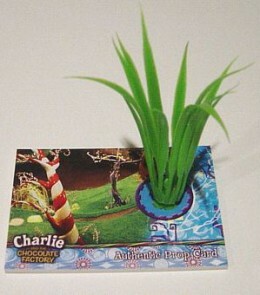 2005 Artbox Charlie and the Chocolate Factory has two incentive cards with fake grass from Willy Wonka's wondrous factory. 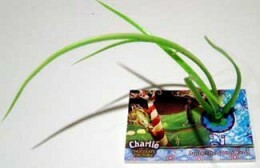 The short grass version is limited to just 39 copies and was given to dealers ordering 25 cases. The long version (#/95), which is absurdly long, was given out to dealers at the New York Toy Fair. Needless to say, they don't show up often. How would you store one of these? What are some of the memorabilia card oddities in your collection? JOSH ALLEN SANTA HAT # 4 10 RC BLACK FRIDAY 2018 PANINI "BUFFALO BILLS"
2018 TOPPS NOW World Series Game Used Base Relic Auto 99 HR MAX MUNCY Dirt! Awesome write up! Never knew the bug cards existed.. If I opened a pack with a spider in it I would FREAK OUT! !